My entire autograph collection...posted one day at a time. I met him at a Minor League game at Jack Russell Memorial Stadium in Clearwater, Florida in 1993, when the West Palm Beach Expos came to play the Clearwater Phillies. 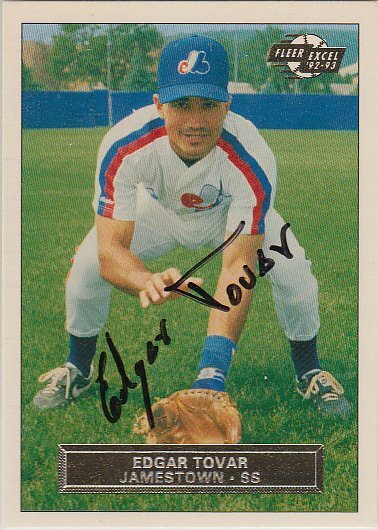 Edgar signed a 1993 Fleer Excel card #62. My name is Dan and I live in St. Petersburg, Florida. Every autographed sports card you see posted is in the exact order of how it was obtained. Want to see who will be next? Click on the calendar link at the top of the page. I only ask for one autograph from each person. Once I get an autograph from someone, I never ask again. I do not sell or trade any of my autographs. New autographs are posted every morning at 10am EDT. Feedback is always appreciated. I enjoy reading your comments. If you'd like to reach me privately, click on the Contact Me link above. © 2013-2019 Daily Autograph. Awesome Inc. theme. Powered by Blogger.